Met with Tom Mylan of The Meat Hook and Jon Feldman of Open Air Publishing a couple weeks back. They've developed an iPad App all about motherfucking bacon! Yes dudes! It's called The Better Bacon Book. They took us through the app and it blew my mind. I've held out on the iPad forever based entirely on my slow-to-the-gamedness. But after seeing this thing in action, I found myself muttering, "Wow, I really need to get one of these devices." 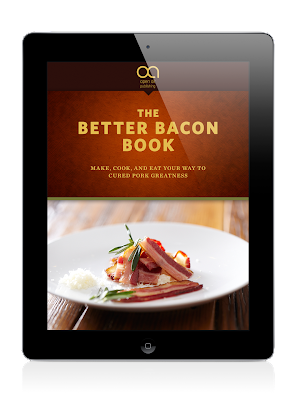 The app combines video, interactive illustrations/recipes and Meat Hunx-worthy photography, all elegantly designed to trick you into learning everything ever about bacon. Five minutes after playing with this thing, and I'd learned the history of bacon, how to build a smoker with a metal garbage can, and the true difference between slab, face, Canadian, Guanciale and Pancetta bacon. Not too shabby. Meat Hunx likes the way you think Tom Mylan. We salute you! Get the app at Open Air.